Developer Asi Cymbal thinks his proposed residential community here is just what this city needs to liven up a derelict stretch of its riverfront downtown. The futuristic, three-tower complex would include about 1,000 rental units, three restaurants and a marina. There’s just one problem: The tree standing right where one of the towers is supposed to sprout up. And not just any tree. It is a roughly 80-year-old, six-story-tall African Rain Tree, the largest of its kind in Florida. Mr. Cymbal has an elaborate plan, involving consultants and a mover of giant famous trees, to relocate it about 800 feet away at the entrance of the property and build a park around it. Even though Mr. Cymbal wants to save it and not chop it down, some of the city’s tree lovers are upset. They believe that if the tree is moved, its days might be numbered. “It will die a slow, agonizing death,” says Charles Livio, an arborist in nearby Oakland Park. 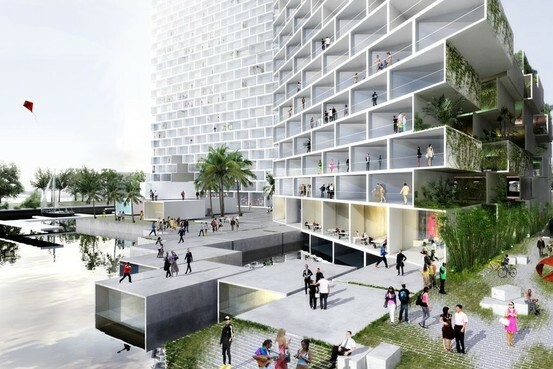 Marina Lofts/Bjarke Ingels Group A rendering of the proposed Marina Lofts residential and retail community in Fort Lauderdale, Fla., designed by the architectural firm Bjarke Ingels Group. 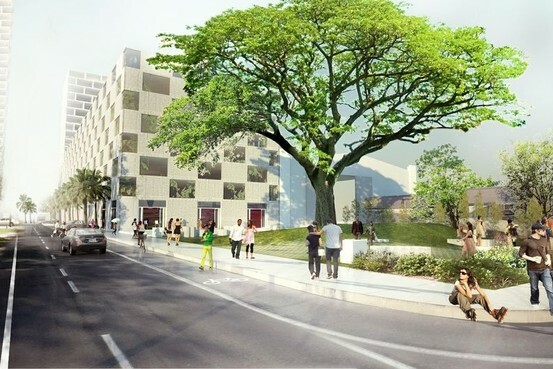 He and others opposed to the relocation urged the Broward County Commission to pass a measure that would have declared the tree historic, an effort that failed in December. Now, they have turned their attention to the City Commission, which has the authority to prevent the tree’s relocation because a 1987 ordinance declares it protected. The commission is expected to take up the matter in the spring. He says transplanting it to a new park would ensure it gets enough sunlight—rather than surround it with buildings—and allow the public to finally enjoy it. For years, it has been sitting on an empty lot behind a chain-link fence, he points out. Many people didn’t even realize the tree’s significance until all the bickering began. Marina Lofts/Bjarke Ingels Group Another rendering. To handle the move, Mr. Cymbal hired Environmental Design, in Houston. The company specializes in moving giant trees and installed the National Christmas Tree on the Ellipse in Washington, D.C., last year. Two years ago, the company successfully transplanted a 150-year-old, 800,000-pound oak nicknamed Mr. Al—comparable in size to the rain tree—in Iberia Parish, La. The tree is doing “fabulous,” as if it had never been moved, says Tom Cox, the company’s chief executive. Relocating the African Rain Tree would involve a meticulous process, Mr. Cox says. Months before moving it, his crew would prune its roots and fortify it with water and nutrients—”comparable to getting ready for a significant operation,” he says. Builders have been uprooting and moving big trees since at least the 1920s, when William Randolph Hearst had cypresses trucked in from Paso Robles, Calif., to his castle in San Simeon, 40 miles away. Mr. Cox says his company has moved tens of thousands of large trees and 98% of them have survived, he says. L. Thomas Chancey, a Fort Lauderdale arborist, says he was hired by the previous owner of the riverfront lot to see whether it was feasible to move the rain tree, and he concluded it was too risky. The property ended up in bankruptcy, and Mr. Cymbal bought it in 2011. The dispute has blossomed into a battle as well over the design of Marina Lofts, by Bjarke Ingels, a 38-year-old Danish architect whose futuristic designs often leave critics swooning. Renderings of the development, known as Marina Lofts, show three large towers that look like stacks of white bricks, with chunks missing and a jagged split between two of the buildings. Mr. Cymbal says he envisions it as a “cool, hip environment” that will draw young professionals with its affordable rents, eateries and a public plaza. It includes green roofs and landscaping, meaning the rain tree would be surrounded with greenery. Joshua Miller, the 30-year-old owner of a media and graphic design studio, loves it. “It’s awesome,” he says. “People leave Fort Lauderdale because nothing new happens…This is new and different and creative.” He and a group of friends have been distributing petitions in support of the community at art walks and parties they organize. Opponents of Mr. Cymbal’s plans say they are glad he is developing the lot, but just want him to downsize Marina Lofts and build around the rain tree. “We’re not a bunch of crunchy granola fanatics,” says Rose Bechard-Butman of the Fort Lauderdale Garden Club.